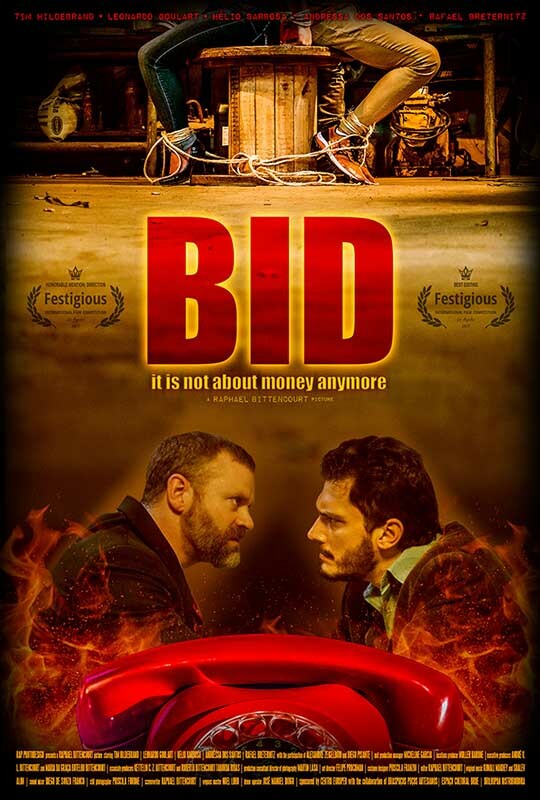 STUDIO CITY, Calif. - July 10, 2017 - PRLog -- The short movie BID, which main theme is the unfolding "B side" of the recent big corruption cases in Brazil, has just been awarded in Los Angeles. Directed by the Brazilian filmmaker Raphael Bittencourt, the film got the Best Editing and the Honorable Mention: Director in the Festigious International Film Festival. All the narrative was built from the combination of several real situations dug by Bittencourt, who was also the screenwriter of the piece. The story isn't a documentary itself, but it's based in actual happenings and real facts. The elements from an obscure universe that haunts the basements of power and big business world and the dirty deeds and schemes of the Brazilian mafia that inhabit the daily news today were preserved. The project was developed former than a year, at the exact same time the impeachment of the Brazilian Ex-President Dilma Rousseff, the frequent news form the "Operation Car Wash", an attempt to clean all the dirt, and a number of other corruption cases involving politicians and big businessmen. The idea of the film, though, is older than those happenings and Raphael was already investigating the related facts and situations for years. The heavy scenes, which could be in an authentic and sadistic action thriller, bring an explicit and uncomfortable message about the sad an, many times, dangerous reality of big business of public interest in Brazil. The director says "…unfortunately most people don't realize the gravity of the many corruption related cases. They contribute themselves with the perpetuation of harmful schemes that haunt the country by throwing away their votes in a putrid political class." He continues "…during the first private screening of BID, in Warner Brothers, the majority of the crowd was really tense with some fairly heavy scenes. They asked me if that was a fiction and when I told them that, unfortunately, it wasn't, they were shocked and asked me if I wasn't afraid of telling this story." Regardless the astonishment, the film was applauded by a standing crowd that day and art fulfilled its provocative, disturbing and outraging role and proposed a deep reflection about the matter. The independent characteristic of the film resides not only in the theme and approach. It was an international production that involved Brazil and United States and professionals from several different nationalities. The research phase, of course, started in Brazil. The script was developed in Los Angeles by Raphael. The pre-production and development of the project happened in the US and Brazil simultaneously so the shootings could run as seamlessly as possible in the city of Curitiba, Brazil. Back to the States, with all the material shot, Raphael took care of the post-production himself and oriented the creation of the soundtrack. All the structure and production were made viable with Bittencourt's personal resources, with the work, many times volunteer, of the team and the support of some companies that embraced the cause. Absolutely no federal, state or city money or incentive was used. Proving that independent film making can happen in Brazil without that kind of resource was also one of the objectives of the production. Looks like the plan is working and it is actually the first part of a bigger plan: a feature film with the same theme and even more striking. If you would like to receive more detailed information about the production of BID and the Director Raphael Bittencourt or set up an interview with him please contact RAP Photodesign ( http://www.001rap.com (http://www.001rap.com/) ).